The Gospel first came to the northern English in 627, when King Edwin of Northumbria was converted by missionaries from Canterbury. Edwin’s death in battle in 632 was followed by a severe pagan reaction. A year later, Edwin’s exiled nephew Oswald gained the kingdom, and proceeded at once to restore the Christian mission. During his exile, Oswald had lived at Columba’s monastery of Iona, where he had been converted and baptized. Hence he sent to Iona, rather than to Canterbury, for missionaries. The head of the new mission was a gentle monk named Aidan, who centered his work on Lindisfarne, an island off the northeast coast of England. Aidan and his companions restored Christianity in Northumbria and extended the mission through the midlands as far south as London. 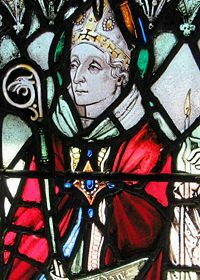 Cuthbert was the most popular saint of the pre-Conquest Anglo- Saxon Church. He was born about 625. In response to a vision of the death of Aidan of Lindisfarne, Cuthbert entered religious life and was formed in the austere traditions of Celtic monasticism. He was Prior of Melrose Abbey from 651-664 and was then Prior of Lindisfarne. Made Bishop of Hexham in 684, Cuthbert continued to live in Lindisfarne. He died at his hermitage on March 20, 687. Cuthbert accepted the decisions of the Synod of Whitby in 663 that brought the usages of the English Church in line with Roman practice. He was, therefore, a “healer of the breach” that threatened to divide the church into Celtic and Roman factions. I am someone who has been greatly inspired by the Celtic saints, and who has been on a personal pilgrimage to Lindisfarne and other Celtic Monastic sites in the Uk and Ireland. It is moving to me to see us embrace this part of our Christian heritage. I must admit some uneasiness, though, with the statement, “…that threatened to divide the church into Celtic and Roman factions.” From a historic perspective, this is a bit overdramatic for me, as is so often the case when the Synod of Whitby of mentioned. 6 years before the Synod, the churches of southern Ireland had already abandonned the traditional Celtic calendar and adopted the Roman one; rather than threatening to divide the church, the Celtic church had already substantially moved towards a position of uniformity with the Continental Church. The Synod of Whitby was a local decision that affected the Kingdom of Northumbria and Northumbria only – not the entire ‘Celtic Church’ – and the historic move was towards rapproachment. Rather than speakig of a threat of division – which perpetuates romantic images associated with Whitby – I think it would be more historically accurate to simply say that his humility permitted him to accept the decision, thereby strengthening the unity and peace of the Church. Collect: This collect prays well. Hebrew Reading: This is Canticle 10 in the Book of Common Prayer 1979. Should it be noted as such? In other places (see Annunciation of Mary) when a Canticle is suggested for a reading it is noted. In the caption to the Propers, the words “and Cuthbert” should be in square brackets (Aidan is already in the Calendar). In line 7 of the second paragraph, substitute a capital M for the lower case “m” in “midlands”. (It is the recognized style in the UK for such an area). These are two major Caltic saints. The question is, should that be celebrated together, or should their traditionAL FEAST DAYS BE RETAINED? I can see both sides of the question, but can’t decide. I personally believe that, once set, Saints days should not be changed for poetry or convenience. Members of our congregations have chosen these saints names for themselves or their children, and identify a specific day with that saint, as has the sommunion of saints that has gone before. As one whose name is Thomas, and who was born on Dec 21 and named after St. Thomas, I am thankful that the Anglican Communon churches are the only catholic churhces that have not changed this date in recent years.